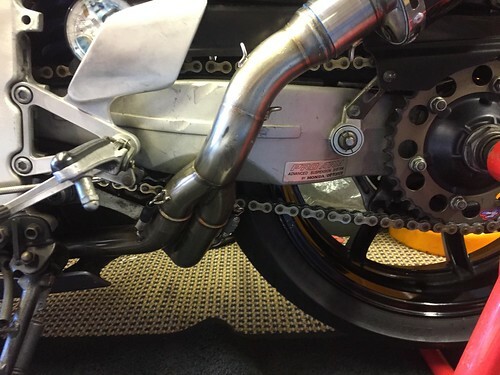 Have you tried adjusting the position of the muffler and routing of the exhaust? 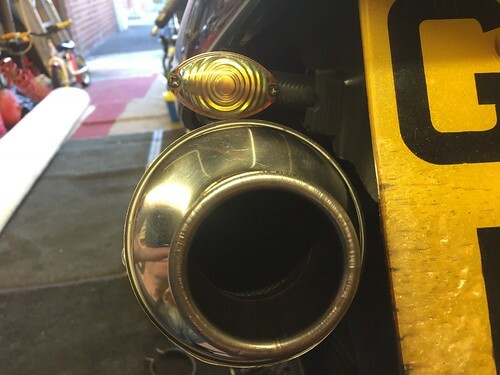 I had a similar problem when I fitted the exact same Tyga can to my NC35, except I have the original indicators and the can touched the outside edge, rather than the underside as yours does. I tried adjusting the system but there wasn't enough flexibility to clear the indicator. Eventually I added an extra nut and 3 washers to the bolt which holds the strap to the hanger. I put them on the bolt BETWEEN the strap and the hanger, which had the effect of pushing the can outwards several mm. and therefore clearing the indicator..just. I think I may have used a longer bolt to accommodate the additional fittings. You could try something similar but it looks like you would need to add more nuts and washers than I did to move the can out enough. You don't notice the extras on mine but you may do if you add significantly more. I also thought about removing the hanger and trying to bend it slightly (in a vice). I even bought a spare one to try it but in the end didn't need to. That might be an option for you. I have tried both the ways you have mentioned but every time I go to tighten up the clamp it pulls the silencer up where it shouldn’t be. I have looked at that but mine is too far in for that, mine needs lowered, so I might have to make some kind of bracket to lower the hanger. Yup, that's an option. I considered it but got away without the hassle of making one. If I was to make a bracket to lower the hangar by a few mm. I would design it so that it fitted to the 2 bolts on the frame rail, then bolt the hangar to it, rather than make a bracket that fits between the hangar and the strap, which is likely to look a bit weird. The bracket would be out of sight behind the seat panel and would probably be more secure. Just in case you haven't already thought of that! Was wondering if this is a common problem with the tyga silencers. Don't know if other people on here have had the same issue but I'd be interested to know how you solve the problem. 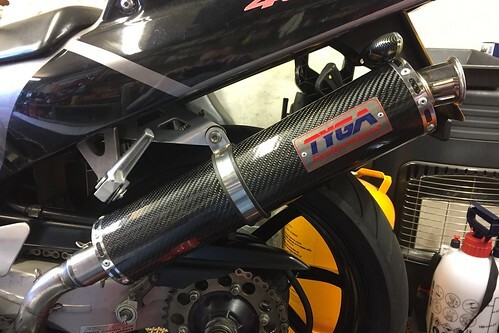 Do you need the Tyga exhaust hanger to go with the Tyga exhaust system? My hanger already had a second set of holes drilled and I did this to move the strap forward a bit (off the Ethos label) but thinking about the geometry of it...it must also have moved it down slightly. Might be enough to give you the clearance you need. 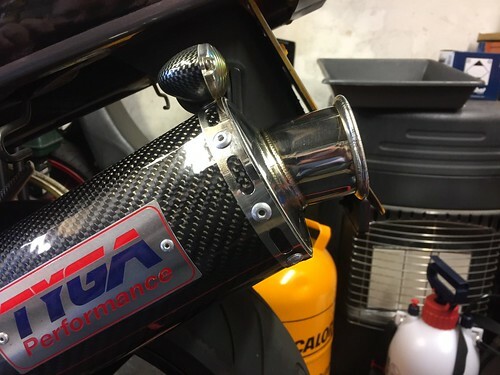 Thanks NGneer I’ll enquire with the tyga importer and see what he says, but it doesn’t say anything on their website about using a tyga exhaust hanger that’s what made me think it’s compatible with the oem hanger. I have a spare hanger so I’ll definitely give that a go and see what happens. 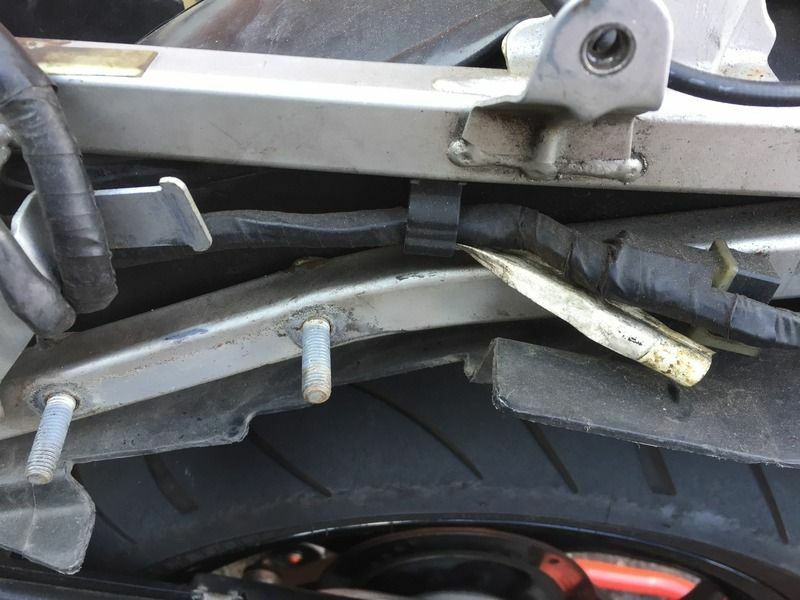 Finally got round to removing the seat unit and have noticed that the sub frame has a curve in it, should it be their or should it be straight?